The use of stevia and inulin - a phytonutrient found in in high concentrations in the yacon root, as well as in herbs such as chicory, dandelion, and elecampane - is gaining traction as a healthy alternative to table sugar. Up to now, the addition of these natural, plant-based sweeteners has been largely limited to beverages like coffee and other herbal infusions. This is because certain proportions of table sugar are important in the structure and texture of baked goods, making sugar hard to substitute. A experiment carried out by a quartet of researchers at Lincoln University, New Zealand, has found a muffin recipe that is healthier while still retaining a palatable texture. Their research has been published in the International Journal of Food Science and Technology. The basic idea behind stevia is that it is much, much sweeter than table sugar, so much less of it is needed to achieve the same level of sweetness, making it a no-calorie option. Inulin, on the hand, is a sweet dietary fiber molecule that is not broken down in the stomach and has a much lower caloric value compared to table sugar. They found that while the 100% stevia and 100% inulin muffins had an objectively much firmer texture, the 50% stevia and the 50% inulin muffins had a similar texture to the standard 100% sugar muffins. They then simulated the digestion of the five different muffins to measure how quickly basic sugar molecules were broken down and released 20 minutes and 60 minutes after the digestion simulation started. 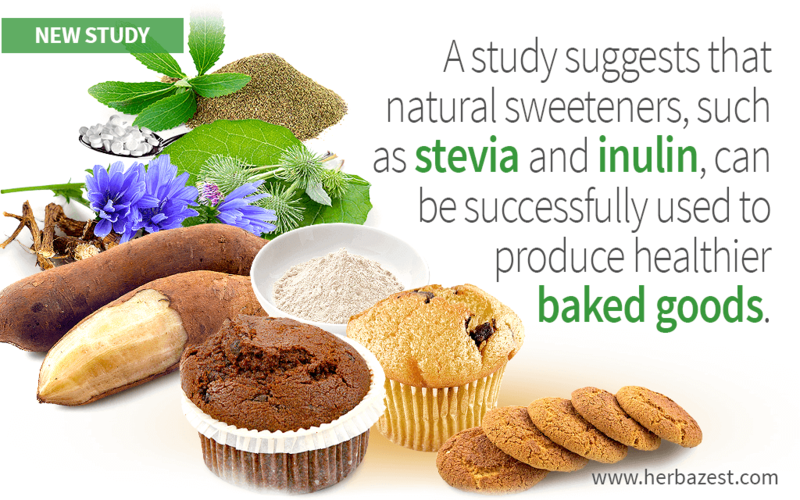 The least amount was released in the 100% stevia muffin, followed by the 100% inulin, 50% stevia, and 50% inulin muffins. This slower and lesser release of sugar averts spikes in blood sugar levels. These results could lead to an expansion in the use of the plant-based sweeteners, such as stevia and yacon in commercially-produced baked goods as well as in homemade preparations. Health-conscious bakers at home could follow the recipe in the study or experiment with their own ratios to make muffins and other goodies that are both delicious as well as low in calories and hypoglycemic.